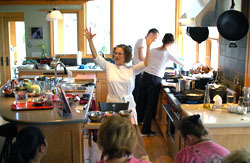 When you take a class at Lenore’s, you will learn how to prepare all aspects of vegan cooking, fermented foods, conscious protein choices, and living foods. Recognize how foods affect your moods, appeal to the senses and how to use them to achieve greater balance. We use only purified water and organic ingredients, mostly grown right outside our front door. We never use cane sugar, dairy, meat or chemicalized ingredients in our recipes. Ample tastings offered. Taste high quality, healthy ingredients and find out where to get them. 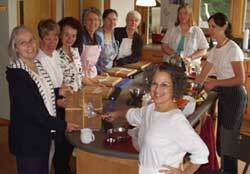 Enjoy Lenore’s fun, conversational teaching style and her clear, step-by-step instruction. Learn short cuts and countless “tricks of the trade”. Treat yourself to exhaustively-researched kitchen tools, knives and cookware at the school store. Discover how to organize your kitchen and appreciate how efficient your cooking will become. Tour our demonstration organic vegetable garden and our sustainable and dramatic solar home See WNC Green Building Directory article. "You are a walking wealth of information on health and healing." ~ Betty J. "Your enthusiasm was contagious!" ~ Pat R.
"I feel very motivated to take better care of myself and my family without being overwhelmed. Thank you." 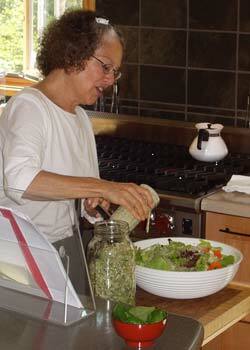 ~ Wendy W.
"Your recipes were delicious and easy to make - easier than I thought they would be. I will sign up for another class." ~ Helen B. "I am extremely happy to be around people involved in this way of life. I enjoyed learning, helping and cutting before classes." ~ Rebecca R.
"My food tastes better these days. My meals are more balanced." ~ Margaret B.
Enrollment is limited to 12, so register early! We will send you the recipes for the cancelled class. You can send a substitute in your place. Class fees are fully transferable to another class up to one week prior to class. If we cancel the class or workshop, we will refund your payment to you. Saturday, May 18 10-11:30 am "Naturally-Fermented Sauerkraut Workshop" - $20 All thriving, traditional cultures eat fermented foods. Do you? 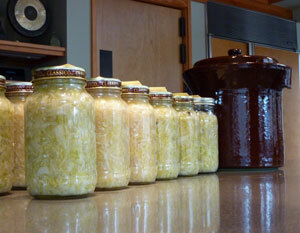 Learn the art of making your own lively, tangy and delicious sauerkraut in this hands-on workshop. You will discover that fermented foods are brimming with probiotics and 26 other health benefits! 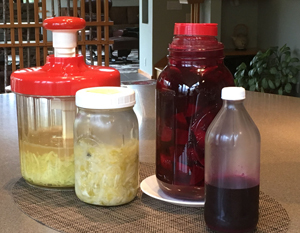 Add-On Module (to the Sauerkraut Workshop), May 18, 11:30 - 12:15 pm "Fermented Beet Kvass Drink" - $10 Effervescent Beet Kvass is an invigorating, fermented beverage with no added sugar! You will love this flavorful, rejuvenating and healthier alternative to kombucha. Saturday, July 20 10-12:30 "Dress Up Your Salads" - $35 Discover how to use key ingredients to create professional, creamy, tasty, low-low fat, delicious, speedy AND healthful dressings. Tips for prep, storage and salad additions including edible flowers. Includes generous tastings. 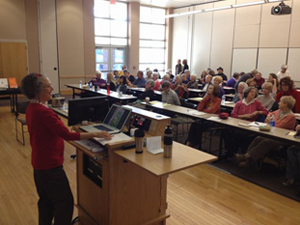 Osher Lifelong Learning Institute (Summer Term): June & July, 2019 "Exploring Healthy Habits"
Saturday, Date TBD 10-12:30 "Power-Packed Breakfasts" - $35 Kick-start your day with tasty, powerful nutrition using ingredients like chia seeds, hemp hearts and other superfoods. 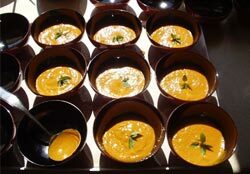 Learn to make quick yummy chia breakfast pudding; sensational, green smoothies; wholesome baked granola with variations. Seating is limited so check to see if there is room and register early!